Me and my dream: a Gulfstream Vintage Cruiser 19ERD, Woody edition. 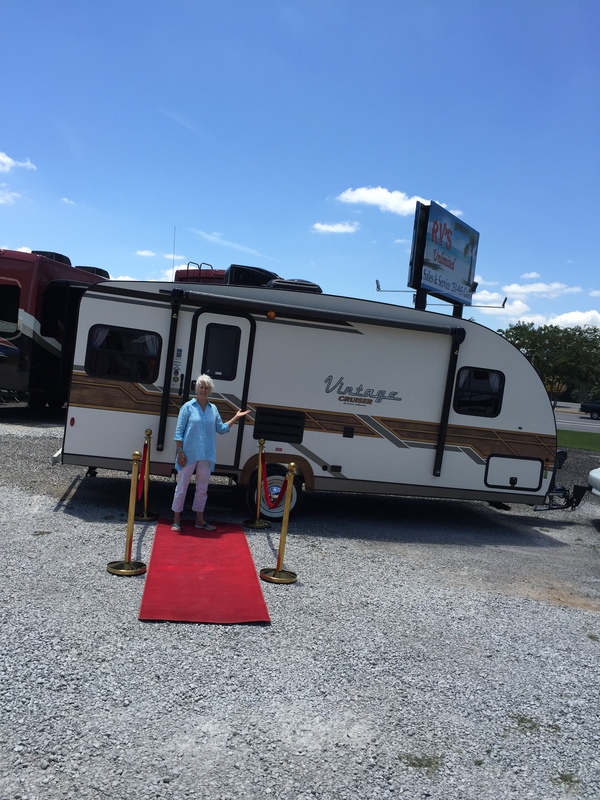 There I am in the above photo, the red carpet treatment provided by RVs Unlimited. The people there made it all a great deal of fun, and at one point I realized: It has been a long time since I have had such real fun. I was given a thorough orientation on the travel trailer. Keep in mind I am a total newbie, and such is my nature that I ask all manner of questions for no better reason than I like to learn everything in the world. I am a lot clearer about amps and voltage now. I began to get quite confident, as I had also looked at a lot of YouTube videos and nothing seemed too strange, until we came to the hitch set up. Sorry I do not have a photo of the hitch. Huge and elaborate. Bars, chains, correct tension here and there. It looked surely powerful enough to haul a town behind me. Dollar signs danced in front of my eyes. Then it was time to leave my new friends, and I was a little sad. They were such fun! However, I drove away with confidence. After all, I have experience hauling a big horse trailer. Although never far from mind is the memory of how one time I took the fender off the horse trailer at a gas station. That left me with a fear of gas pumps. To this day when I fuel up, I pull far wide. With this memory in mind, I had already gotten gas and would not need to stop with the travel trailer. I drove home with ease that amazed me. I felt the trailer behind the car but had no trouble pulling it. And it was at times near bumper to bumper traffic going 70 mph down the highway, as is common in summer on the Gulf Coast. I did notice plenty of room between me and other vehicles, as if angels parted the ways. I was happy, and I sensed my husband smiling from above. I often thought about that sway bar and repeated: Remember to remove it before you back it. God, please prompt me. I became confident that I would remember. In fact, I pointedly remembered as I turned into the driveway: Get out and remove the sway bar. Then one minute later I was careful to figure where to turn to get in line for backing up into the carport, and I totally forgot the sway bar. I went forward, backed up slowly, forward, back, forward, back more, and then: OHMYGOSH, THE BAR! I threw the SUV into park and jumped out to fearfully approached the hitch. The bar was tight, but it wasn’t bent. I got it off. It really seemed fine. I breathed deeply and gave thanks. Once more I backed up and forward. It was up to me. There was no one to help me, and I had taken on the responsbility after all. If I was to be an RVer, I had to learn the jobs. I took my time, used my mirrors, figured out where the trailer went when I turned the wheel left and right, got out only about a dozen times to check. Inch by inch I aimed for the shelter. It took looking at this photo to see something I had not noticed for hours of orientation and standing right in front of it as I learned about the hitch. The left woody decal is missing. The dealer has it on order. She–I have named her ‘Little Lucy’– is home now. And I am happy. I have vague camping plans at this time. Right now I have to catch my breath and figure out how to put what in the trailer. I want to read manuals–yes, sometimes I read manuals. And I go out and sit in her and play 50s and 60s rock and roll on the stereo and imagine the places we’ll go. I also think a lot about the places I have been in my life. Sometimes I am astounded at the things I have done in my life that I did not know I could do. I think it is mercy that we often don’t know what is ahead, how hard things will be. If we knew the problems of being parents, we might not have children. If we knew the ups and downs of marriage, we might never get married. I think of how we all go one day at a time. Wow! When you talked about a RV you meant business. I imagined something about 1/2 that size. BRAVO! Where are you planning your first trip to be? Can’t wait to hear of your travels. It looks bigger in the picture but in reality it is only a 19 footer. Big enough for me! How exciting! You inspire me. 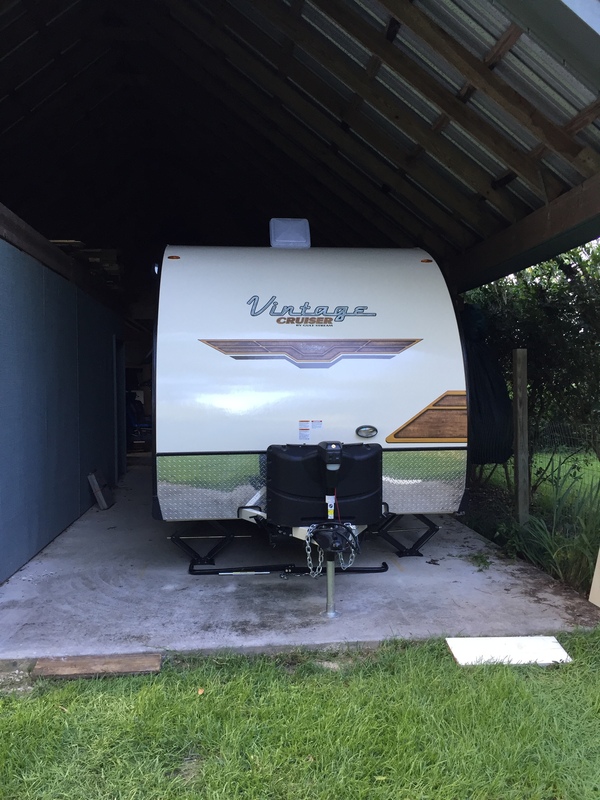 I can’t afford an RV of any kind at the moment, but if one presents itself at the right price, I am going for it! You blaze a trail for me in more ways than one. Love you my friend! She’s a beauty. I fear backing anything larger than a standard pickup in. We keep saying we are going to get a motor home, but I change my mind every time. You are a brave lady! Love reading this. So glad I came across your site. Been a huge fan for a long time. It was my pleasure to meet you at the RWA conference in Orlando in 2010 (yeah, I’m a wanna-be). Look forward to reading more about your camping saga. My husband has a big camper he uses for festivals and loves it — he is a musician — I am a reluctant camper. Keep writing!!!! I can’t wait to start our travels. I will be with you in thought and prayer! Won’t we all have fun!! That is awesome. I can hardly wait until it shows up in one of your novels! I can’t wait until we all go on your first trip!